Compliance Training (OSHA) | Select Strategy Inc.
Are your employees as safe as they can be? Are your lessons legally and OSHA compliant? 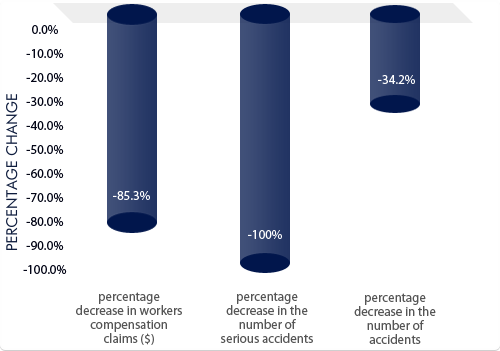 Are accidents leading to high insurance premiums? The Select Strategy team consists of professionals including degreed engineers, ergonomists and certified safety professionals with full memberships in various professional organizations namely, the American Society of Safety Engineers (ASSE), the Human Factors and Ergonomics Society (HFES), the International Ergonomics Association, the System Safety Society, the Institute of Electrical and Electronic Engineers, technical writers and software development engineers and programmers. Our objective is to help employers meet their OSHA requirements and help keep employees safe on the job. OSHA requires employers to understand the specific hazards in their environment; guard against these hazards and train their employees on the relevant OSHA topics to keep them safe. Failure to do this can result in very significant OSHA penalties, especially if an OSHA compliance officer considers failure to comply to be willful. Our courses are fully interactive and workers learn by doing. Creative interactive group based training for less literate or computer literate parts of the workforce. Topics are also translated into foreign languages to facilitate learning. Workers find our courses fun and easy to use, so they remember the info more easily. Our courses are always on, so you can organize lessons when it suits your schedule. There are no half measures in compliance - employees proceed to the next topic when they get 100% correct or when the student achieves the appropriate passing grade. Quizes can also include hints and explanations. The system administrator can easily review student grades and number of question attempts. The system administrator can at the click of a mouse see who has not completed training to facilitate easy record keeping and follow-up. You choose the employees you want trained. You tell us which OSHA topics you want them trained on. Our consultants and OSHA experts meet with you and fully customize these OSHA topics to meet your specific company's environment and safety needs. Our human factor engineers and organizational psychologists ensure that the content is easy to understand and absorb. We set everything up and provide you with individual usernames and passwords for each employee that will do the lessons. You just need access to the Internet to be up and running. Note: This list is not exhaustive and course titles and content are customized to meet individual company safety needs. Some topics are mandated by OSHA depending on your hazards. We have helped our clients reduce accidents and training costs by 50% and more. Helps you meet legal compliance / regulations. Completely customized to meet the specific hazards in your environment. Manufacturers often do not realize that OSHA requires companies to train on specific hazards in their environment. Online solutions that make record keeping so easy!! Takes all the hassle out of it. Client obsession is one of our core values - Nothing is too much to do for our clients. Put us to the test. 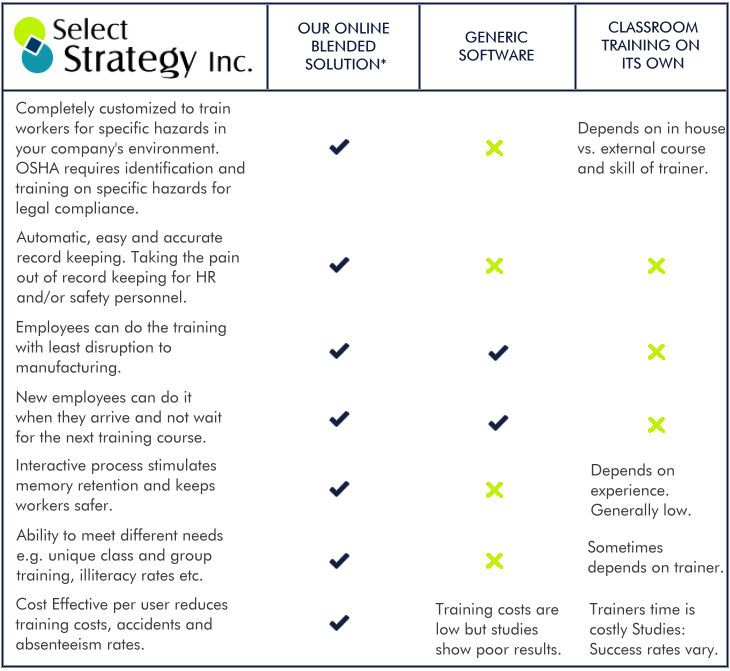 * If required, our online training solution and content can also be efficiently integrated with or complement your in-house class room training to improve your over all costs and results. Fayona Meyerovitz is one of the founders of Select Strategy, Inc. since 2001. She has over 15 years of management consulting experience and has consulted at the most senior management levels in all her client organizations. She is a qualified organizational psychologist and is registered with the International Association of Applied Psychology (IAAP). Fayona has been instrumental in designing our client's Human Capital systems and processes. This approach has created a set of consulting and technology solutions that are easy to use while improving our client's productivity, employee well being and performance. The success of her strategic approach to human capital issues is seen in the faces of her very satisfied customers which include Fiber Innovations, FUJIFILM, Caterpillar (Africa), Senior Aerospace, Intel, Cambridge Portuguese Credit Union (CPCU), BASF and ITT. Fayona was repeatedly elected as President of the New England Chapter of the Human Factors and Ergonomics Society (HFES). She also chaired the Chapter Revitalization sub-committee and subsequently Chaired the Chapter's Committee, internationally. (The HFES, formed in 1957, is the largest multidisciplinary non-profit international professional association with over 4500 members. It is concerned with the study of human characteristics and capabilities and with the application of that knowledge to the design of the products, systems and environments that people use, with a focus on employee well being and ease of use.) Her achievements in this professional organization and contribution to the discipline of human factors have won her multiple entries in the Marquis Who's Who, including but not limited to Who's Who in America, and the silver anniversary editions of Who's Who in American Women and Who's Who in the World. Fayona was in private practice as an organizational psychologist for many years, consulting to companies in industry, assisting them with their human resource issues. Prior to this she was the National Head of Human Resources for the Boston City Campus Group in Johannesburg, South Africa. Boston City Campus has campuses country wide and her responsibilities included founding and managing the human resources function in all 16 campuses throughout the group. Fayona is not just a pretty face with an intellect, she also has a Licentiate in music from the Trinity College in London. Mr. Meyerovitz co-founded Select Strategy, Inc. in 2001. David has over 20 years of management consulting experience. David brought this deep knowledge of the management consulting business combined with his keen strategic problem and technology solving skills to the firm. This has contributed to a very satisfied base of small, medium and large clients. David's knowledge has a helped to create a powerful set of consulting processes and technologies that have significantly benefited Select Strategy, Inc. clients. David's better known clients include Pfizer, FUJIFILM, Walmart, The Enterprise Newspapers, Fiber Innovations, Blitz Media, Energizer (Battery Company), Raytheon, Biogen Idec, BASF and EDO Corporation. Prior to founding Select Strategy Inc, David was a senior case team leader at the Monitor Group. (The Monitor Group was founded by Professor Michael Porter from the Harvard Business School in 1984, and has over 1000 professionals in 25 offices around the world advising Fortune 500 companies and other large corporations on strategy.) David was responsible for leading teams of consultants and managing client relationships to devise strategic answers to business and organizational problems, implement solutions and train clients to ensure sustainable results. Due to his seniority in the firm he also had line responsibility in marketing, recruiting, business and application development within the firm. He was also involved in various European, Eurasia and African strategic internal initiatives. David was at the firm for six and a half years and was responsible for a large base of clients each with annual revenues in excess of $1 billion. He has degrees in business and accounting with sub majors in finance and economics and is also a qualified Chartered Accountant. David worked at Grant Thornton International from 1991 to 1995. (Grant Thornton International is a leading accounting and financial advisory firm offering services through member firms in 110 countries, including 49 offices in the United States.) The firm awarded David a scholarship for his university studies based on his academic results. During his time at the firm he led audit teams and advised large publicly traded corporate clients as well as small to mid size entrepreneurial minded businesses. David loves to meet new people and share experiences. Jack Laveson is a System Safety and Human Factors/Ergonomics Specialist with over 25 years experience. He is also an Air Force Certified System Safety Manager with experience in system safety analysis, design and research. Jack has worked with a number of commercial and government affiliated clients while serving the public interest in safety. Preparing portions of a commercial training project for a packet switching network course. Another training effort consisted of the development of a comprehensive nine-hour videotape human factors training course for a Fortune 500 firm. Providing human-computer interaction and related human factors support to the Federal Aviation Administration's (FAA) Advanced Automation System. Based on both human factors principles and procedures elicited from active controllers, this work resulted in safety critical interface designs for use with advanced hardware and software. Facilitating system safety support for the Department of Defense Teleport System, used for satellite communications. In this project, he identified hazards based on system safety analyses and OSHA requirements as well as developing mitigation techniques to reduce those hazards. Developing systems and ergonomics requirements, as part of a systems analysis group, for an Internal Revenue Service major system development program for forms scanning and image storage. A combination of systems engineering, task analysis, and workflow analyses were used in the documentation development process. Providing systems analysis support to identify system safety and human computer interaction issues associated with the Army Global Command and Control System. He developed and conducted safety analyses and participated in the development of a user interface design and style guide for development. Aiding in the preparation of a Navy Training Plan (NTP) for a sea computer based automated correlation system for multi-source information. The NTP identified manpower, personnel, and training requirements for effective system operation. For another Navy project, he assisted in the development of a methodology for the early identification of manpower, personnel, and training requirements. Dr Laveson has a Ph.D. in Human Factors and Environmental Science, and a Masters and Bachelors of Science in Electrical Engineering. His professional affiliations include the System Safety Society, Human Factors and Ergonomics Society, International Ergonomics Association. Institute of Electrical and Electronic Engineers, Association of Aviation Psychology, Association for Psychological Science, Association for the Advancement of Science, and the American Educational Research Association. Jack is also a retired Army Reserve officer and served as Lieutenant Colonel Individual Mobilization Augmentee assigned to the Army Research Institute for the Behavioral and Social Sciences. Scott Fulmer is a safety training and ergonomics specialist with more than 13 years experience. The thrust of his work in the ergonomics field has been in the measurement and reduction of risk factors for musculoskeletal disorders found in the workplace. More specifically, his consulting and training related work has included ergonomic exposure assessment, ergonomic training, ergonomic committee facilitation, ergonomic assessment methodology training, implementation of ergonomic solutions, work environmental policy and health analysis, and he has also been called on to be an expert witness. A sample of his clients, include the National Institution for Occupational Health and Safety, Massachusetts Department of Public Health Occupational Surveillance Program and the NH Automobile Dealers Association. Scott's work has been published in various well know publications including the Journal of Occupational and Environmental Hygiene, the American Journal of Industrial Medicine, and Applied Ergonomics to name a few. He has also been requested to speak at conferences including, to name a few, the "Summer Institute" of the University of California's Center for Occupational and Environmental Health, the American Physical Therapy Association -Occupational Health Special Interest Group Annual Meeting - Orthopedic Section, the 12th Annual Construction Safety and Health Conference, Rosemont, Illinois and the Annual Conference of New England Chapter of American Industrial Hygiene Association. Scott has a Bachelors of Arts in Psychobiology and a Masters of Science in Ergonomics. He is also a member of the Human Factors and Ergonomics Society and a member of the Association of Teachers of Preventive Medicine. Niles Welch is a senior engineering consultant/trainer. Niles is a published author and engineering specialist with expertise encompassing system safety, reliability, maintainability, mechanical and aerospace engineering. He is also skilled in human factors engineering, health hazard assessments and OSHA requirements. He has developed a quantitative assessment process for human error and was a featured speaker at a recent national American Society of Safety Engineers (ASSE) Conference. He is a Certified Safety Professional with a specialty in system safety, and has received several awards including the President's Award, System Safety Society, 2000 and 2003; Best Paper award, the International System Safety Conference, 1999. Niles is also a Reliability, Availability, Maintainability, and System Safety (RAMS) trainer having taught RAMS courses either individually or as a combined RAMS course over the last 30 years. In a previous employment capacity Niles was also the Principal Safety Engineer and Safety & Human Factors Engineering Section Manager at Raytheon (a Fortune 100 Company) where he was responsible for managing large teams of engineers as well as performing and generating extensive system safety plans, hazard analyses, and fault trees, to name just a few. Niles has a BS in Aerospace Engineering; and a Master's degree in Mechanical Engineering and is a Certified Safety Professional (CSP). He has also served on the executive board of the System Safety Society and was also the Co-Chair of the 22nd International System Safety Conference, held in August of 2004. He is currently the Chapter President of the Winners Circle Chapter of the System Safety Society. Charles Abernethy is an independent consultant in the interpretation and application of behavioral science, with Behavioural Implications Management. Charles consults not only in traditional human factors areas, but also in use case analysis, information architecture development, and user interface design for software and web user interaction for marketing, insurance, IT and telecommunications software and hardware organizations, and in accessibility. Previous experience includes founding and managing a distributed Human Factors group in Maynard MA for a Fortune 50 multinational, and work at the U.S. Department of Transportation in Cambridge MA. Charles is well known for leadership roles in the development of international and national standards, regulations, federal and state legislation, product certification, and related public policy issues. Charles has published in peer-reviewed and business journals, interacted with the media, received design awards, and holds technology and design patents. Charles previously served as NEC President, chaired the Ely Outstanding Paper Award committee, and is a Fellow of the HFES. Dr. Abernethy has a Bachelors of Science in Electrical Engineering, a Ph.D. in Experimental Psychology and is a Certified Human Factors Professional (CHFP). Elana Siew is a Manager within Training Services. She is a qualified MBTI user having qualified to use the MBTI profiling tool to assist people in ascertaining their personal profiles and training needs. She is also a qualified 16PF5 administrator. Elana is also a member of the following professional bodies: MFSA, IPM, SABPP, SIOPSA. She currently works as a management consultant and trainer. She has been active in training, coaching and facilitating individuals on all levels of the organizational hierarchy. Elana has a Bachelor of Commerce degree and an MBA and is currently completing a Masters Degree in Industrial Psychology. She began her career marketing adult literacy courses to corporate bodies bringing in millions of dollars worth of work saving her employer from bankruptcy at the time. She was instrumental in structuring a partnership merging Government, Private and Non-profit organisation to launch a national 3 phase literacy program. Neale Anthony Roberts is a Manager within Training Services. He actively coaches and mentors management and sales teams in corporations whose incomes range from multi-million dollar companies to small businesses. He effectively saves organizations money by defining a path of performance drivers for both teams and leadership teams to adhere to. Neale's academic qualifications include a Bachelor of Arts degree (Economics and Sociology), a postgraduate Marketing diploma and a Master of Business Administration degree having passed with distinction. He is also a qualified Chartered Marketer CM(SA) and a Certified Financial Planner (CFP) licensee. He is a qualified MBTI user having qualified to use the MBTI profiling tool to assist people in ascertaining their unique MBTI preferences or "unique gifts". Neale led the Bond MBA business team from Australia which competed in the World Business Planning Competition in San Diego in 1998, being placed second out of 40 business schools including Ivy League schools from the US and around the World. Neale has also lectured Leadership and Strategy to MBA students.